Marg’s Taco Bistro – Sip a delicious vanilla coconut margarita at this stand-out bistro, which features a wide variety of tacos in different flavors that you can mix and match. Hang out on the covered patio, or stay late and hit up the pool table and game room in the back. 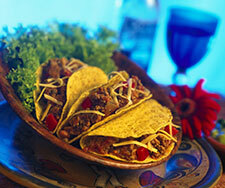 Tacos Jalisco – This popular taco joint is a local favorite and is known for authentic cuisine and an interesting menu. Choose from Mexican specialties with California twists, such as smothered burritos, street tacos, garlic shrimp and pork carnitas. Bill’s Rotisserie – Order quesadillas, tacos and giant burritos stuffed with juicy rotisserie chicken. Service is fast and the atmosphere is no-frills. La Bamba – Enjoy big portions and fast service at this family-friendly restaurant, which also features a full bar with tasty margaritas. Relax in a comfortable environment and casual atmosphere. Do you have questions about Truckee dining options? Our friendly staff is always ready to help answer all your questions about the local area. Stay at our hotel, and make the most of your Cinco de Mayo celebration at our gorgeous lakeside hotel. Call today!